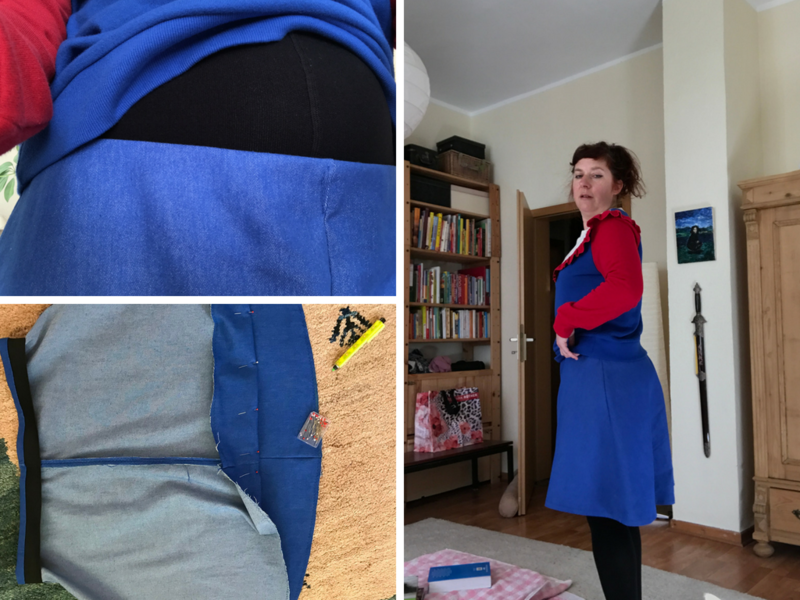 This time you will not laugh at me – no humour in this post – only success 😀 I will show you an easy method to sew a panel skirt. 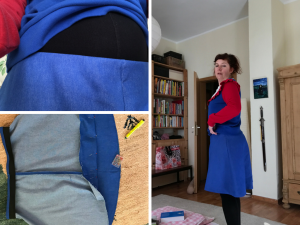 If you want to skip my fantastic story why I made this skirt and only want to read the tutorial, jump to the headline “the actual tutorial”. By the way, I finished my Miette cardigan, only the buttons are waiting to be sewn on and I think it is wearable. And with “wearable” I mean wearable in a place which is illuminated and populated by people. The replacement should have a quite similar colour, but a much better fit. Next step: the fabric store. I bought a nice steal blue slightly stretchy jeans fabric. Unfortunately, it was not so cheap, so I bought less than I would normally buy for a half circle skirt. 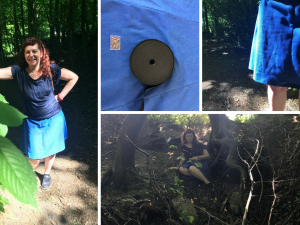 Very clever, if you want to make a half circle skirt…. At home after a coffee I finally understood what I had done: not only I had saved money, I also had bought too little fabric. After helping my brain with more caffeine, I searched my store-bought skirts and noticed that they are mostly made of panels. I calculated weird mathematical equations in my brain (reality: I fumbled along with skirts and fabric till everything fitted) and understood: smaller panels, less fabric. My go to pattern for a half circle skirt consist out of three parts, the front, the back, and the waistband. Now I would make four panels and no waistband. I could fit the four panels in opposite directions on the rectangular fabric so that always the widest part of one panel is beneath the smallest part of the next panel. This is possible, because the jeans fabric has no pattern and I did not mind if the fabric direction is not the same. I made the panels by using an existent store-bought skirt, which I put on a newspaper to copy its outlines. Then I added seam allowances to this pattern and cut it out. Now I fitted the panels on my jeans fabric. Here you must pay attention to the stretch of the fabric. The panels should be so aligned, that that the waist is parallel to the stretch of the fabric. Check if all four panels fit on the fabric. Next step is putting weights on the paper pattern. Then copy the outlines with chalk on the fabric, or if you are bold or lazy like me, simply cut the panels out. 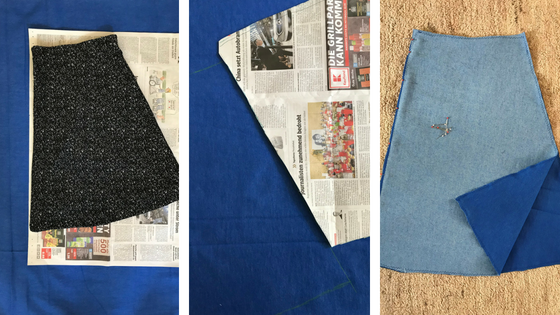 The next step I so boring… but with jeans fabric there is no way around: seaming all of the edges to stop fraying. Now put the right sides of two panels together, waist on waist and pin one side together, then sew it. 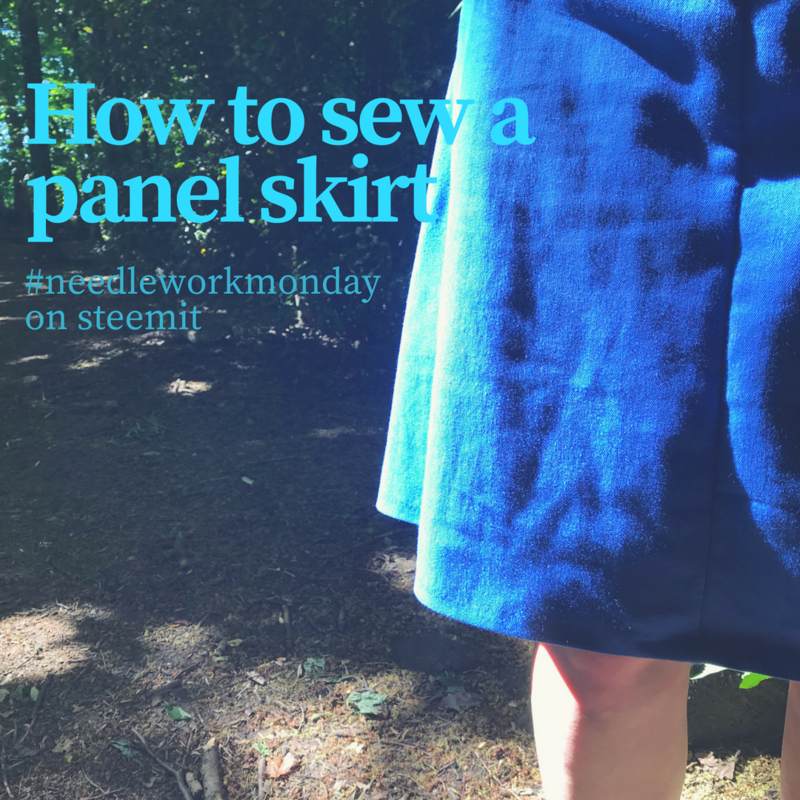 Repeat with the other panels but leave the last seam open and test if the skirt fits. If all is well, you can proceed to the waistband. 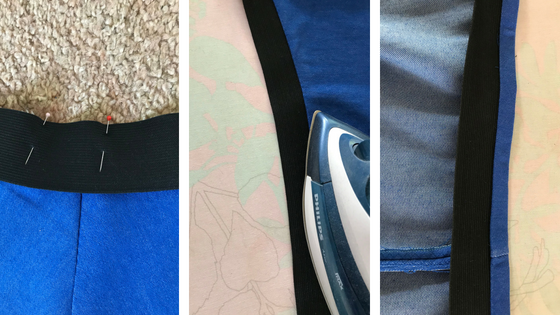 To save further on the fabric I made a waistband out of an elastic, that I folded over. Therefore, I cut a 4 cm elastic band in length of my hip, because I wear my skirts very low, to avoid belly ache (I really hate belts….). The length of the elastic band should be a little bit smaller than your actual measurements – but do not forget to calculate a seam allowance. Now sew the elastic into a ring. This ring will now be sewn right side to right side on the waist of the skirt. Therefore, you must measure and mark four points (middle of the front and back and the sides). These for points need to be pinned on the skirt. To achieve this, you must stretch the elastic a bit. Afterwards you can put some more needles in, so that sewin it on becomes easier. But stop, the last step is missing, the hem: instead of folding the hemline two times, I used a colourful bias band which I folded into the skirt, ironed, and pinned it and then sewed it on. Tadaaaaa: the panel skirt. 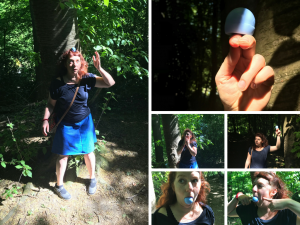 My super creative friend Silvia Szlapka made the photos. 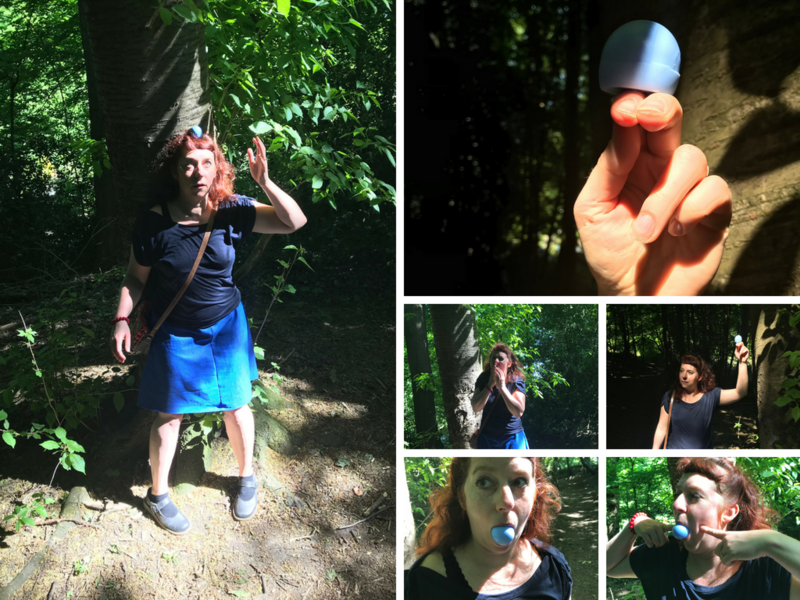 You can see me worship my new blueberry lip balm, which happened to be in my bag.